2 www.motorequipmentnews.co.nz 11330 NETT CIRCULATION Six months Ended 1st Half 2008 Editor: John Oxley Email: editor@motorequipmentnews.co.nz Contributors: Ross MacKay Advertising manager: Annie Cope Email: annie@motorequipmentnews.co.nz Automotive Group Sales Manager: Dan Prestige Email: dan@motorequipmentnews.co.nz Publisher: Cathy Parker Email: cathy@adrenalin.co.nz Subscription Manager/Enquiries: Annette Colbert Email: subs@motorequipmentnews.co.nz Proofreading: George Ward Adrenalin Publishing Ltd 14C Vega Place, Mairangi Bay PO Box: 65092 Mairangi Bay, Auckland 0754 Phone: 09 478 4771 • Facsimile: 09 478 4779 Subscriptions: Motor Equipment News–an 11 issue magazine subscription in New Zealand is $59 (incl GST). Please call us for overseas rates. CONTENT Copyright Motor Equipment News is copyright and may not be reproduced in whole or in part without the written permission of the publisher. Neither editorial opinions expressed nor facts stated in advertisements are necessarily agreed to by the editor or publisher of Motor Equipment News and, whilst all efforts are made to ensure accuracy, no responsibility will be taken by the publishers for inaccurate information, or for any consequences of reliance on this information. 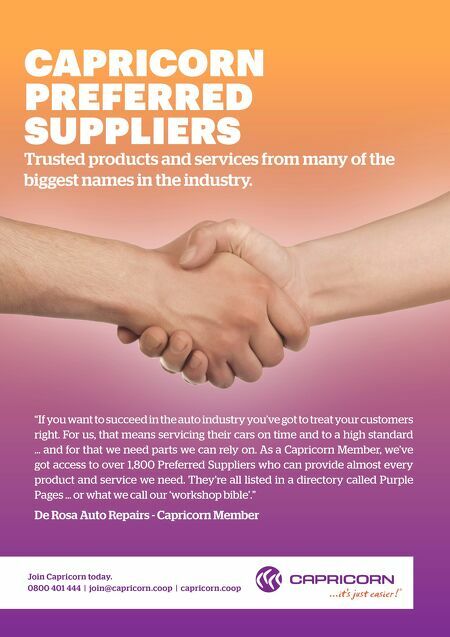 Printing: ImageCentre ISSN 1175-1908 Website www.motorequipmentnews.co.nz 10,623 NET CIRCULATION First quarter 2017 November 2018 8 OEM news 14 EValuation 16 Servicing 19 Diagnostics 24 Panel & Paint 25 Diesel Industry News 23 Business directory 29 Motor sport E D SPE A K New World dangers One area the pro-electric brigade is punting hard is safety, with recent (unsubstantiated) claims that Tesla models are the safest cars in the world. However, let me tell you, after a recent "second honeymoon" trip to Europe, the facts just don't add up when it comes to the reality of New World transportation. Bicycles are great, but I've never been closer to getting knocked over than I was in Edinburgh, where the cyclists zoom along the city's footpaths and walkways at enormous speed, so only basic instincts prevent you becoming the target of a 70kg student on a fast-moving steel machine. Then on to the motorways on our trip to visit my roots in Yorkshire. Which were the vehicles that hogged the right hand lane the most, while travelling way below the speed limit? Yes, you've got it, Nissan Leafs, with seemingly a holier-than-thou attitude, "I'm saving the planet, screw you". And on to the narrow twisting roads of the Derbyshire Peak District, where one 2km queue was headed by – you've got it, a new Mercedes electric SUV, complacently creating a mobile road block. Then we flew to Paris. Oh boy, is it unsafe for pedestrians there! Since I last visited this great city it has changed dramatically, and motorbikes and motor scooters dominate the roads. The closest I came to being hospitalised was when one 500cc "scooter" slipped through between me and a car which had stopped to allow us to cross at the "green man" zebra crossing, actually touching my sleeve as it passed. And what about the electric scooters? These are of the type you stand on and normally scoot along with your foot, except they have electric power, are completely silent, and zoom along the footpaths at high speed. It's all about give and take, I know, but this new age of anti- car, anti-petrol, and especially anti-diesel seems to be breeding a new class of road (and footpath) users who just don't care about anybody else. And that attitude WON'T save the planet. 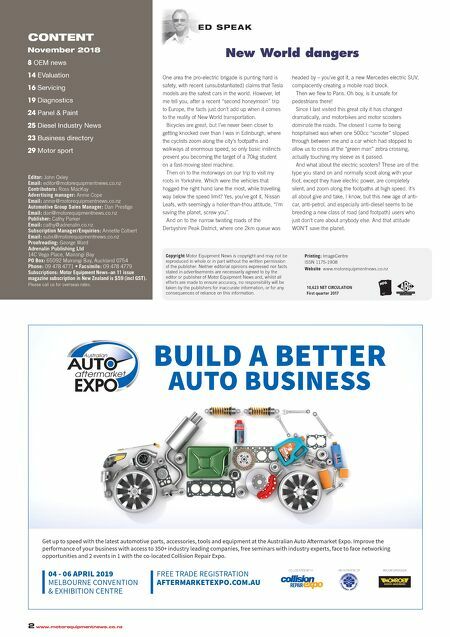 BUILD A BETTER AUTO BUSINESS 04 - 06 APRIL 2019 MELBOURNE CONVENTION & EXHIBITION CENTRE FREE TRADE REGISTRATION AFTERMARKETEXPO.COM.AU CO-LOCATED WITH AN INITIATIVE OF MAJOR SPONSOR Get up to speed with the latest automotive parts, accessories, tools and equipment at the Australian Auto A‚ermarket Expo. Improve the performance of your business with access to 350+ industry leading companies, free seminars with industry experts, face to face networking opportunities and 2 events in 1 with the co-located Collision Repair Expo.